After looking at this piece I realized that I wanted the background value to be much darker to help draw the viewer's eye to the dogs, my focal point. 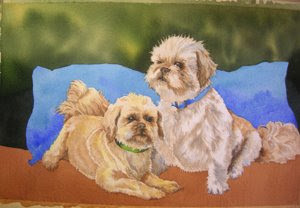 I mixed some Perylene Green into the mixture that I used for the brown area under the dogs to create a wet, rich color for the background. I applied a wash of clear water to the background then, I dripped color from this mixture into the wet background area. I used strong color and allowed it to flow around by tipping my board. I didn't want to completely cover the gold in the background, but I wanted the gold to shine through here and there. Once I dripped in some color here and there, especially along the edges of the pillows and over the dark areas at the sides of the painting, I put my brush down and just tipped the board to allow the pigment to soften and flow. When working wet-in-wet with watercolor, the brush is used to drop in the paint, but water and gravity do most of the work.